This is a collection of various things that I found annoying enough to alter. I collect things that I don't think warrant their own mods into a single mod, to be released to the general public when it becomes more substantial. I've divided this mod into five categories: Straight Fixes, Bug Fixes, Resolution Fixes, Aesthetic Improvements, and Things What Bother Me Fixes. Straight Fixes are fixes for issues I think are genuine errors or mistakes or oversights or what have you. There's a problem, here's a fix for it. No artistic license is involved. Bug Fixes really fall under straight fixes but I've separated them into their own category because they're more severe and there's absolutely no reason not to have them. They fix bugs that could potentially break your game. What I've included are either well known and easy for me to do a quick fix or came to my attention directly. There are lots of other bugs this mod doesn't fix, so I strongly suggest that you seek out a more extensive bug-fixing mod. Resolution Fixes are all textures from the game for which there were identical, higher resolution textures somewhere else in the game files. So I've swapped the lower resolution ones for the higher resolution ones. I've separated these from the straight fixes because a) I didn't make any of the content here - it's all extracted from the game, and b) they don't actually fix "problems" per se - it's just an increase in resolution. It looks the same, with slightly more pixels. Aesthetic Improvements are my attempts to improve the visual quality in certain areas. I've tried to maintain the original aesthetic of the game while improving the quality. But the nature of the improvements necessitates new content created by me. You might not like my work, or you might use a different mod that touches on these areas, or whatever, so I've isolated these from the other fixes. Things What Bother Me Fixes fix things what bother me. They might not bother you but they bother me, so I've isolated those as well. For a full release history, see the accompanied file. This is a fix for a number of issues present on the supermodels, the stock animations used for most characters in the game. 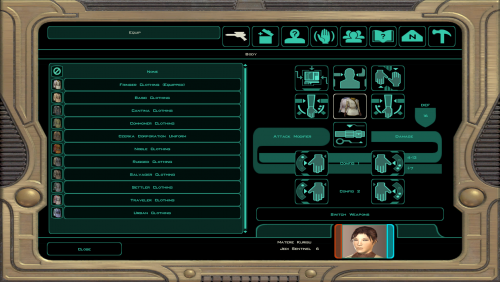 First, Obsidian added several combat animation variations for K2, but they messed up a couple of the names, causing the game to play animations that don't exist and resulting in characters freezing in place. This mod fixes that. 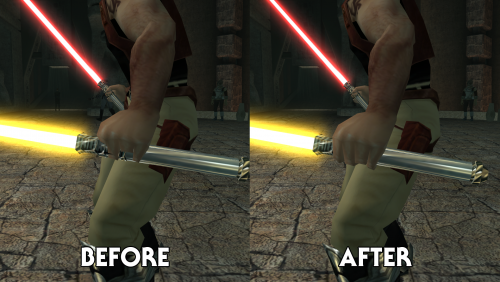 Second, the animations for dual blasters had the hand objects in the incorrect positions. For male characters, the blasters would clip through the hands, and for female characters they would hover above the hands. I've restored them to the positions they were in K1. Third, when wielding dual melee weapons, male hands would clip through the weapons for some animations, notably the looping ready pose. The issue seemed to be that the fingers were gripping the weapon too tightly, so I loosened them up for the male models. I have also added an option to change the melee running animations to match how they are in K1. I included this as an optional part of the installation as it's an issue of preference rather than a straightforward fix. Odyssey++ is a set of user-defined languages for Notepad++. Based on Fancy Colors – NWScript support in text editors, Odyssey++ has been updated for the Odyssey Engine games Star Wars: Knights of the Old Republic and Star Wars: Knights of the Old Republic II – The Sith Lords. It seeks to replicate the basic features you’d expect from an integrated development environment, such as syntax highlighting and autocompletion, to make scripting for these games more convenient. When you write scripts using Odyssey++, the program will color-code everything you type and make suggestions based on terms specific to the NWScript language. Throughout the game, there are cutscenes of the player sleeping and having Force visions to further the plot. This mod fixes two things about those scenes that bothered me. First, the first of these scenes is supposed to happen in the party's apartment on Taris, but is quite clearly set on the Ebon Hawk like all the other scenes. I've edited the area used for the visions to put in a copy of the apartment to make the location consistent. Second, the scenes show the player wearing whatever item they happened to have equipped when the scene started. So the player would routinely sleep in their clothing, even armor. 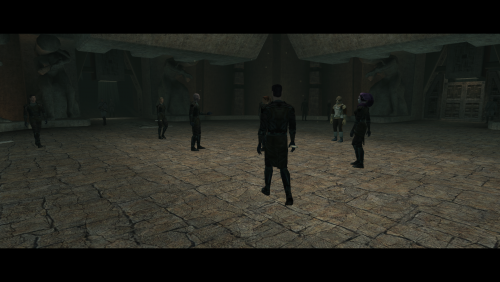 I've edited the cutscene scripts to remove the player's equipment for the duration of the vision. This is a restoration of the original Handmaiden sister appearance. In the original release of the game, the Handmaiden and her sisters all look alike, even even though they comment on her difference in appearance. The developers actually made a unique head for the sisters, but it was left out of the final release of the game. I took that head and merged with the body model used for the Handmaiden sisters in the game, thus restoring their intended appearance. 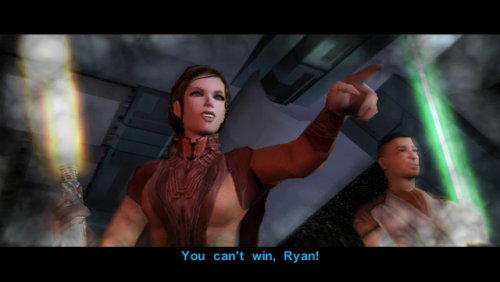 Early in the game, BioWare had Bastila appear in an outfit that's a homage to the infamous Slave Leia costume from Return of the Jedi. But it was just a retexture of her regular underwear. 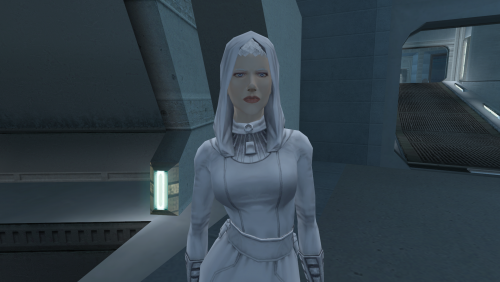 For the sequel, Obsidian made the same homage and included a more elaborate model that could be worn by most female members of the party once the item is acquired. 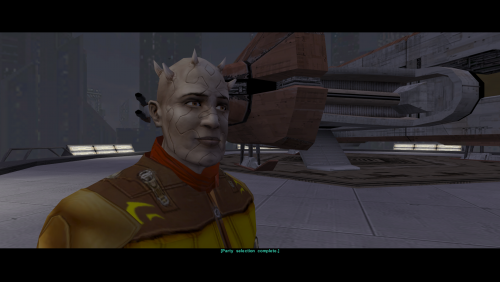 This mod ports the K2 model to replace Bastila's outfit in K1. 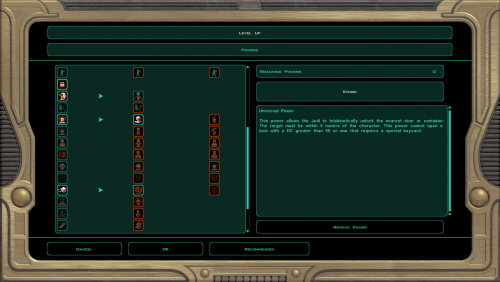 Note that this will not replace Bastila's easter egg appearance because that uses a different line in appearance.2da. 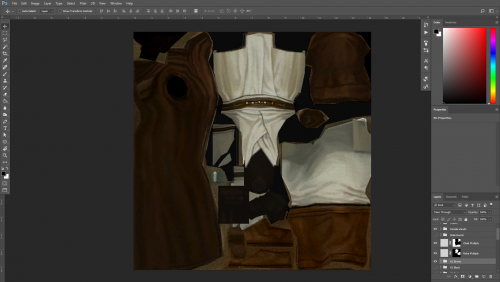 That will have to remain a retexture of Bastila's underwear, unless one were to replace her underwear model with the dancer outfit entirely. 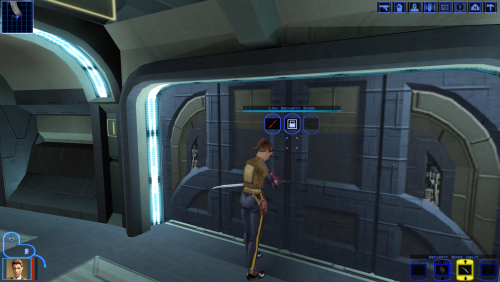 Instead, this mod adds a dancer outfit item that Bastila can wear any time afterwards. It has the same properties as the item from K2 and can only be worn by Bastila. 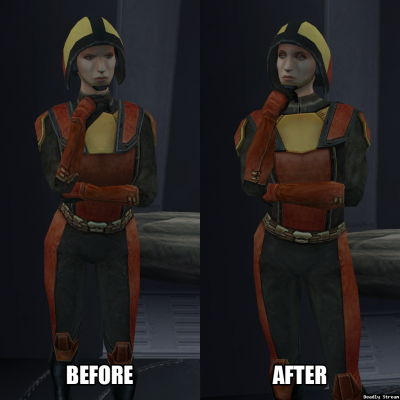 I've modified the dancer outfit model to more closely resemble Bastila's body shape. I've also changed the texture to match her skin tone and fixed a few minor errors I noticed. I've included an alternate texture that changes the outfit's color scheme from red to a sort of dark blue with gold flowers and a lavender trim. I was trying to match the color scheme of her original outfit. @Dark Hope has also made a new texture with that color scheme and it's a lot fancier. Note: This mod uses my Supermodel Port so the skirt can animate. Official support for that, including some hotfixes to make other models, can be found here because I don't want to have to put everything in two places. When wielding dual melee weapons, male hands would clip through the weapons for some animations, notably the looping ready pose. The issue seemed to be that the fingers were gripping the weapon too tightly, so I loosened them up for the male models. If you think you've spotted any other issues, send me a picture so I can confirm what the problem is and whether it's an issue with the supermodels. If so, I'll add it to my to-do list. This mod fixes two problems with the VO in the game. T3-M4 was missing some VO files. This would cause his lines to be skipped when these files were referenced in the original game. The files missing were his short question variants and I was able to edit together new ones using his medium and long variants as a source. Some of the Gand entries were misplaced; they were typed on the unused Gotal line rather than the Gand line. In this case, the VO did exist, but it wasn't being referenced properly in the 2DA file. I've adjusted the file to correct that. 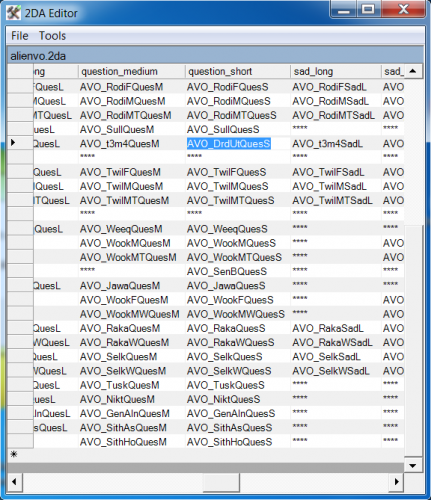 I don't recall if this presented any problems in the released game, but the affected VO files were the question and sad variants. I didn't remove them from the Gotal line in case that was actually used for Gand VO in the game. TSLRCM (as of the time of this mod's initial release, v1.8.5) does address the T3 issue, but it does this by replacing T3's VO with generic utility droid VO, which I really, really didn't like. So if you're using TSLRCM, this mod will revert that change. I've adjusted some of the blade colors; I mainly used math to choose them, placing them at even distributions along the color spectrum, and sticking with the plug-in's default setting for blue. In more practical terms, this means yellow is a bit yellower, while green and violet are closer to the blue end. Blue itself is much brighter than the original. 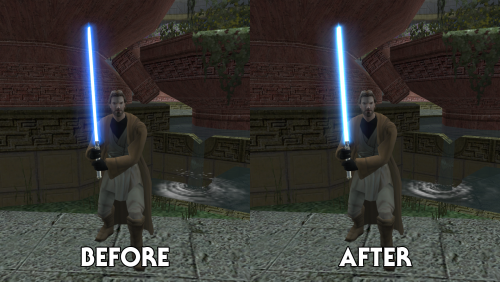 Orange and cyan are no longer reused copies of the Heart of the Guardian and Mantle of the Force colors from K1. They both look more like standard lightsaber blades. Orange's blade color falls exactly between red and yellow - you know, actually orange. Cyan and viridian are evenly placed between blue and green. Silver uses the same color settings as blue, but at 33% saturation. I've added an alternate optional texture to have the viridian blade more closely resemble the original, if you would prefer. It makes all texture variations of the commoner clothing available to the player, with all the items - 11 total outfits - placed in various locations throughout the game. I've placed them where those outfits seemed to be the most popular, so if you see an NPC wearing an outfit you haven't seen before, the item can probably be found nearby. It changes which clothing item the player receives on Telos, based on class as seen in the character creation menu. Only the first clothing item the player receives will be based on their class; players of all classes will still be able to find the other variants elsewhere in the game. 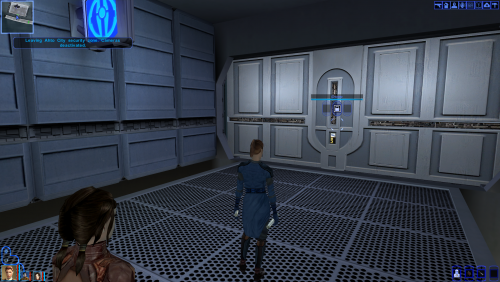 It adds a male variant of the Czerka uniform to match the existing female texture. For whatever reason there wasn't a male variant, so I've cobbled together one from the female variant and the other male textures. It shuffles around some of the textures so the male and female variants match each other more closely, primarily based on color. I've made sure to patch any affected characters to revert their outfits to their original appearances. It adds unique icons and names to all the items, so you can tell them apart. (They were all just called "Clothing" before.) 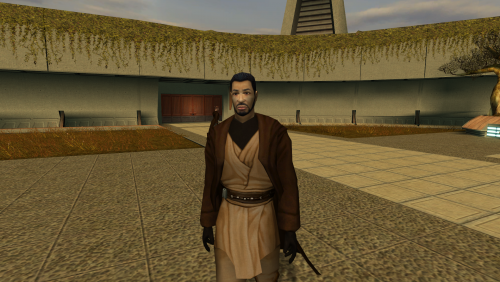 I've named them based on who in the game wears them; for example, two of the outfits popular on Dantooine I've named "Settler Clothing" and "Fringer Clothing". The icons display both the male and female variants of each item, due to the differing appearances. 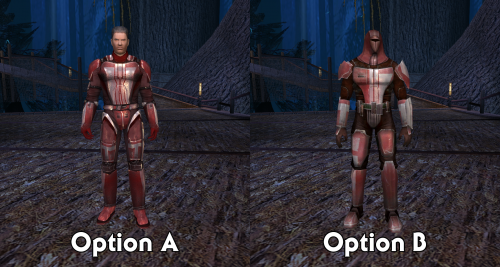 It adds custom icons for Atton's Ribbed Jacket and Mira's Ballistic Mesh Jacket. They originally used the same icon as commoner variant #1, and since I changed that to look like the commoner clothing I saw it fit to give the unique items their own icons as well. It touches up several of the male textures to fix some discoloration and bad seams. I have also included an option to give the commoner clothing some upgrade capabilities. If you choose this option, you'll be able to upgrade the clothing items with some underlays, the same upgrades available to the miner uniform. Some of the appearances were wrong, so they were all clones of Azanti Zhug. 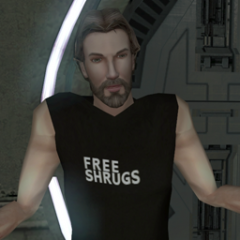 More importantly, all the Zhugs were spawned as hostile. This would cause the cutscene to break if the AI for one of the party members spotted a Zhug and attacked. This had the unfortunate consequence of removing the choice to add a third party member to team up with Atton and Bao-Dur. This mod fixes both of those things. This mod requires TSLRCM version 1.8.5. It may not be compatible with earlier or later versions. Only 1.8.5 has been tested. 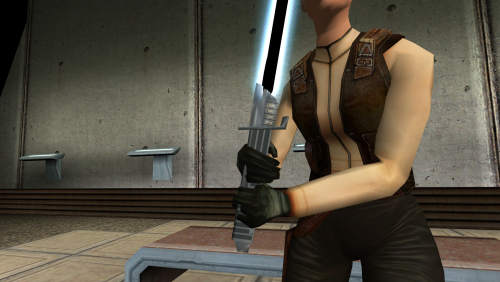 This mod adds the Darksaber, a unique lightsaber seen in the Clone Wars and Rebels TV shows, to Star Wars: Knights of the Old Republic II - The Sith Lords. The Darksaber comes with a custom hilt and blade effect. The Darksaber's stats are better than the standard lightsaber's (+2 Charisma and +1d10 Unstoppable damage) but the item cannot be upgraded. I have integrated the item into the game, but I'll keep the how a surprise. One hint: You must search through the possessions of a certain Mandalorian. 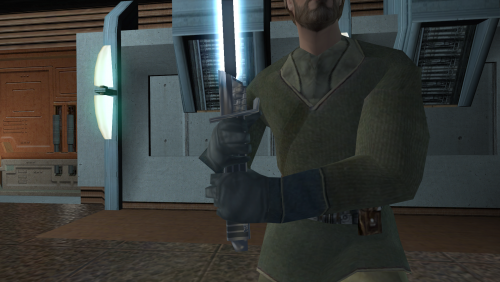 This mod adds the Darksaber, a unique lightsaber seen in the Clone Wars and Rebels TV shows, to Star Wars: Knights of the Old Republic. The Darksaber's stats are better than the standard lightsaber's (+2 Charisma and +1d8 Unstoppable damage) but the item cannot be upgraded. I have integrated the item into the game, but I'll keep the how a surprise. One hint: You will have to complete a side quest that involves Mandalorians. I became so very tired of the low resolution textures for female Republic soldiers. So I made a new model for them, using the male version as a template. While I was at it, I noticed errors on the male model, so I've corrected those as well. 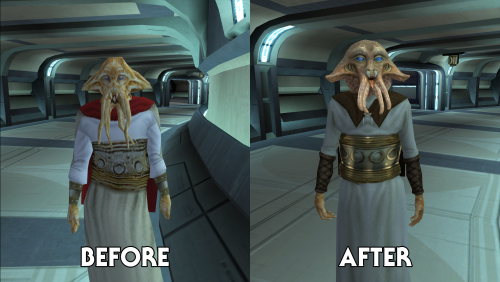 When they made K2, Obsidian removed several shaders from characters that had them in K1. I suspect this was part of a systematic effort to improve performance on the Xbox. There's no such technical limitation on modern computers, however. But the perplexing thing about it is the shaders weren't just removed, but for some characters you can't even give them shaders in the conventional way that would always work in K1. There is another way, oen that other mods have used already, but I think it's a bit of a hack method. Even though I've used it myself for years, I never released my work as a mod because the installation process is less than ideal. Recent insights, however, have allowed me to finally understand why the heck this happens and come up with an alternative solution that doesn't require mucking around in appearance.2da. 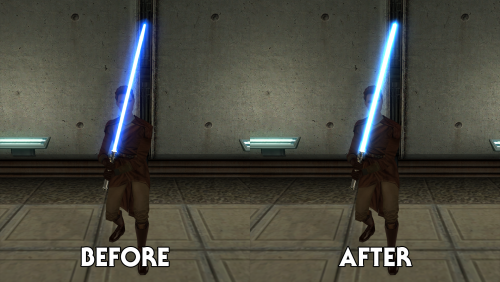 This mod alters the appearance of certain characters in the game, giving them shaders, making them nice and shiny. 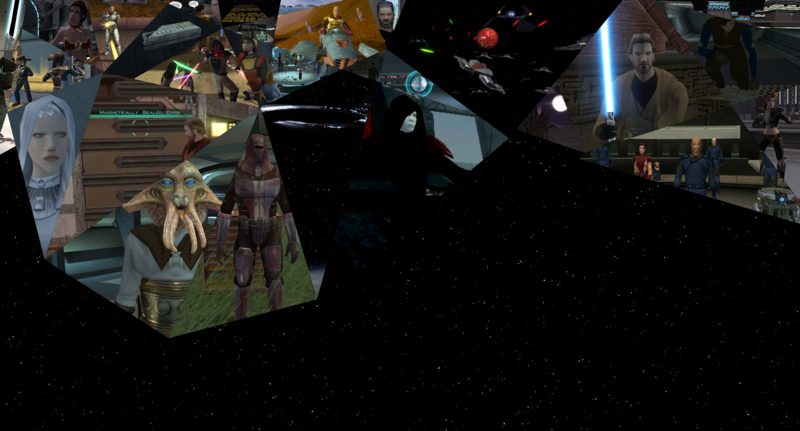 The affected characters are Mandalorians, T3-M4, and all the HK units (HK-47, the 50s, and the 51s). For the Mandalorians, I can safely say their shaders are just straight up missing. They're shiny in K1 and not in K2. In K1 they only ever appear in small numbers, but in K2 there's a whole camp of them on Dxun - I think that was the problem for the poor little Xbox. I've made them shiny again, though I didn't just copy the alpha channel from K1 as I didn't particularly care for it. It looked like there was too much contrast to me, with some parts having no shader and then parts right next to them were totally shiny. I tried to make mine subtler so all the metal pieces have a mild shine, with none on the body glove. 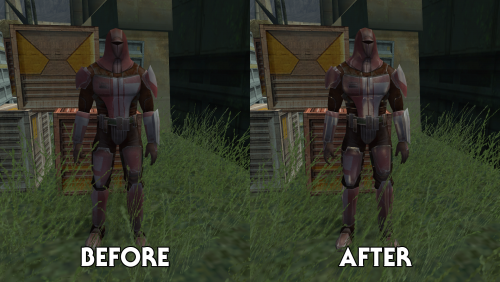 I've also fixed some other issues present on the Mandalorian model. One of the finger bones was visible and there were some smoothing and weighting errors. 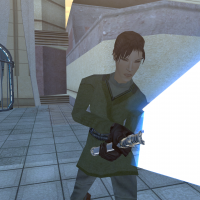 The HK-51s aren't even in the original release of the game. But HK-47 is quite shiny in K1 and I think the later models ought to be as well. While the 51s don't appear and the 50s only appear in small numbers, there was supposed to be an entire factory of them late in the game, so - I think they had their shininess removed for the same reason as the Mandalorians. For the HK-51s, I've also fixed some texture issues around the photoreceptors. HK-47 himself is not shiny in K2 because he's worn down and rusted all over. I don't think a technical reason was responsible for the lack of shaders here; he probably looks as the designers intended. But I thought he could do with a little bit, a hint of his former glory. T3's situation was similar. For both of them, I tried to apply shiny to the parts that look like they're still working, with the amount on all the rust and banged up bits reduced to almost nothing. I've separated them into different folders in case you only want to use some of them.